The Orange High School Library Media Center is a student-centered research, information and circulating HotSpot of Orange High School. The Library supports the school curriculum and because of its flexible access, is considered to be an extension of the classroom. 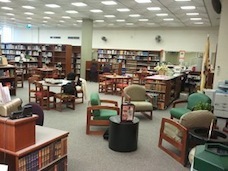 The Library is used throughout the day by staff and students involved in a variety of independent and group activities.